On his day off, Atlanta guide service’s Chris Scalley managed an above average wild Chattahoochee brown trout. Image courtesy of Chris Scalley. Read more about Chris’ River Through Atlanta. Delayed Harvest Trout Season just around the corner! A buddy called me the other day to let me know he’d be through Atlanta in early November. It’s no longer a secret that there is great trout fishing to be had in Atlanta’s Chattahoochee River, only about a half hour (plus or minus traffic, of course) from the world’s busiest airport. Less well known, however, is that late fall through winter is one of best times to get in on a certain subset of the Chattahoochee trout experience. How’s that? Well, from Nov. 1 through May 14, a portion of the river just north of downtown Atlanta is managed ad “Delayed Harvest” trout water – and during DH seasonon the Hooch, the fishing can be sublime. Thom Glace’s “Study of a Rainbow Trout” (Oncorhynchus mykiss). Original donated to Virgina Fly Fishing Festival Auction. Don’t forget there’s lunker browns. Go to Thom Glace’s website. Delayed Harvest trout season (or DH, as it’s often called) is a fisheries management program underwhich selected sections of certain streams are managed under “Delayed Harvest” regulations. Designated DH sections are too warm for trout in the summertime. But from Nov. 1 through May 14 (Georgia’s Delayed Harvest season) those same waters become cool enough to provide good trout habitat. • Toccoa River from 0.4 miles above Shallowford Bridge upstream to a point 450 feet upstream of the Sandy Bottom Canoe Access. • Artificials only (that means no worms, crickets, Powerbait-type bait, or other natural (“digestible”) baits. • Only single-hook lures can be used (in other words, lures with treble hooks are not permitted). This is the go-to guide for fly fishers who want good fly fishing in a beautiful Chattahoochee River setting within the metropolis Atlanta, Georgia. Visiting anglers with limited time will find quick and easy wading access to the DH section at the Paces Mill or Whitewater “units” of the Chattahoochee River National Recreation Area. Bring some ones, because there’s a fee to park. But the river is right there next to the parking area, so it won’t take you long to get on the water. If you have more time or an afternoon free, you might also check out the possibility of a float trip through the DH water (or elsewhere on the river, for that matter) with one of the outfitters licensed to guide on the river. The best sections for such floats will shift as the DH season develops, so check with your chosen outfitter to see what might be best when you’re there. Most of the anglers you meet on the DH portion of the Chattahoochee will be fly fishing. Favorite flies include egg imitations such as Y2Ks or pink Sucker Spawn flies, San Juan Worms or Squirmy Worms, pink Sucker Spawn flies. These patterns work especially well on recently stocked fish (and the Hooch DH is stocked several times through the DH season). But carry some more traditional flies, too (especially midge emergers such as the Zebra Midge or the Blue Assassin) to appeal to some of the more experienced fish. They learn and adapt quickly, and sometimes a more natural-looking imitation is what it takes. One great thing about DH fishing is that you can usually be fairly certain that there are plenty of trout of in the water. 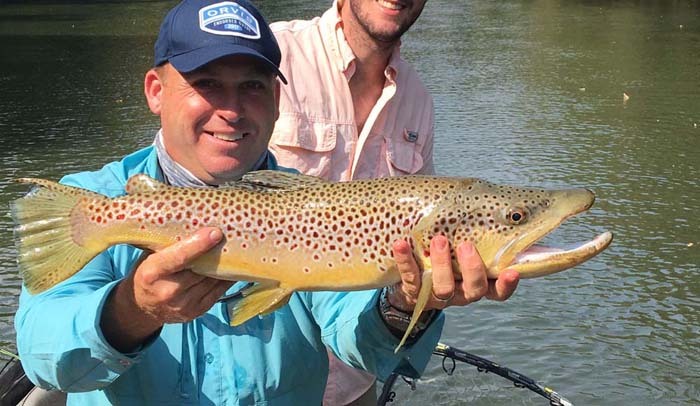 A solid stocking program combined with catch-and-release regulations helps keep the trout population high, and that makes DH waters a great place to hone your trout fishing skills. Because of the large number of fish, they’re also excellent places to take young anglers and introduce them to trout fishing. And to think that this is all waiting for you within sight of busy I-75 and not far from Atlanta’s airport –and if you too have a long layover, I’ll bet you’ll find it a lot more fun than sipping yet another cup of airport coffee. 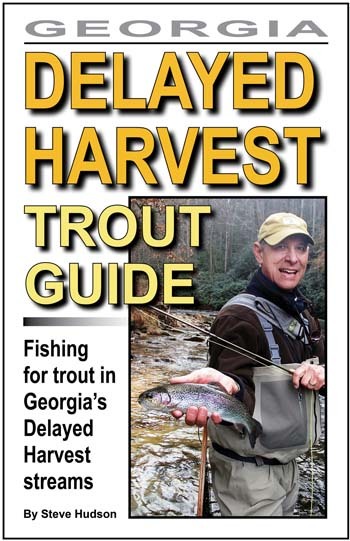 Learn more about each of Georgia’s great Delayed Harvest trout streams in Steve Hudson’s comprehensive 84-page book “GEORGIA DELAYED HARVEST TROUT GUIDE.” Packed with info on access and tactics for each of Georgia’s DH streams, it’s available from local outfitters or on Amazon. Signed copies are available direct from the author at chattahoocheemedia.